Varina Howell Davis was the granddaughter of Richard Howell, the third governor of New Jersey. Her father, William Burr Howell, came to Natchez, Mississippi where Varina was raised in the Antebellum South. William Burr Howell&apos;s bankruptcy during his daughter&apos;s youth affected her throughout her life. She had access to the finest education available to young women of the pre-Civil War era. 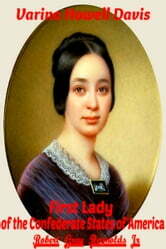 Among the schools she attended was Madame Greenland&apos;s in Philadelphia, Pennsylvania. Her excellent formal schooling and the trying times she endured at a young age shaped her character as an adult. She learned to question the status quo and developed a broad mindedness that was uncommon among her peers. Summary of Barracoon: The Story of the Last "Black Cargo"
What's So Great About Benjamin Franklin? Destination Saipan Was Amelia Earhart A Prisoner Of Imperial Japan? Caryl Chessman: Red Light Bandit? Judith Coplon Barnard College Graduate Justice Department Political Analyst Russian Spy?